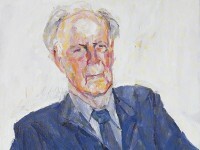 Discover objects given to the Ashmolean in honour of Michael Sullivan. The title of this work is written in archaic script. It is one of a series that Huang Yongyu painted in the 1970s and ‘80s depicting the relevant animal for the year according to the Chinese zodiac. The painting was presented by the artist to Yang Xianyi, the well-known translator of Chinese literature into English who read Classics at Oxford during the 1930s. 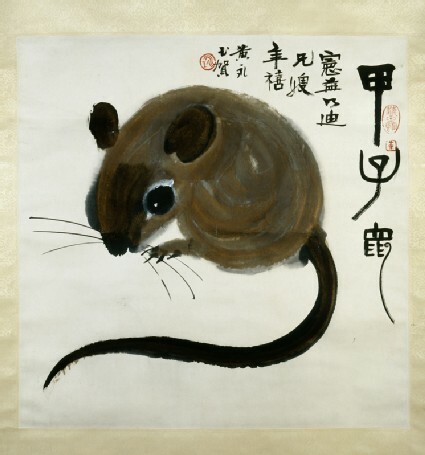 This work shows a timid rat looking at its paw and curling tail, drawn in the Year of Rat (1984) as a gift in celebration of Chinese New Year presented to Xianyi and Gladys Yang, who were both trained at Oxford and are famous translators of classical Chinese literature. This painting was produced among a series of other works in which Huang inscribed the titles in the style of archaic Chinese scripts, rendered in the same free and energetic style. Presented by Gordon Barrass, in honour of Michael Sullivan, 2002.